Hello out there! I haven’t posted in over a week, so in keeping with the spirit of this blog’s purpose, I figured I ought to do an update before bed. I have done nothing new with any existing or prospective projects. The band has been busy the past couple of weekends, and for the last 4 or 5 weekends we’ve had something to do! Weeknights are mostly spent decompressing and keeping the dog entertained. I did add to my stash (bad, bad Mads!!!) with something adorable from the one and only Mood, and I have plans for that stuff already–fitted vintage blouse! In other sewing news, I have decided that Alice has to go. I had hoped that the ease built into patterns, combined with the B-cup standard, would have given me enough wiggle room to compensate for her bust being .5-1 inch bigger than mine, but that’s no longer our only problem. My favorite vintage shopkeeper measured my waist the other day (I asked about a 1930’s evening gown she had hanging up, because duh) and it turns out it’s smaller than I thought. It’s also smaller than Alice’s smallest measurement. (Total thin privilege problem, I know; nevertheless, it renders Alice useless in my hands.) So I’ll try returning her to Joann’s first, and if they won’t take her, I’ll list her online. I’ll most likely be getting a Uniquely You form at some point, since those can be customized. Sorry for the depressingly unproductive update, y’all. Hopefully next time I’ll have actual progress to share! From the front; it’s all one piece! Living to be ~90 comes with a price! 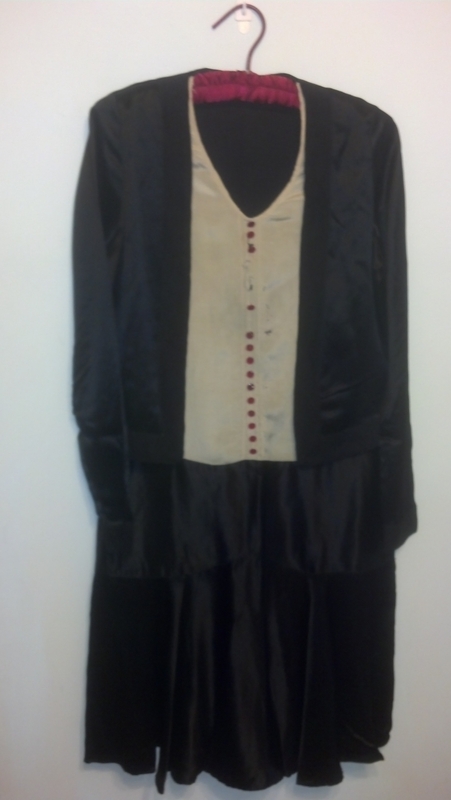 Obviously this dress did not escape the ravages of time as well as the last 1920’s piece I shared. 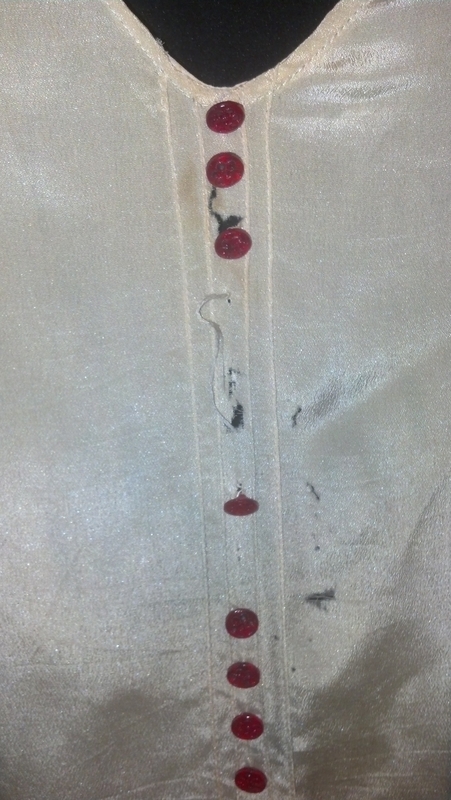 I have no idea what to do about the damage to the cream portion of the dress. The missing buttons have me at a loss, because I doubt I can find any close matches from contemporary collections; not only that, I’m not about to spend a small fortune hunting down actual matching-ish period-appropriate buttons. I’ll keep an eye out around Etsy and eBay and all that for a possible good deal, though! In the meantime, I probably won’t be wearing this out and about. Not just because it’s in rough shape in that area, but because it’s tough to move too much in it: my shoulders, while not linebacker huge by any stretch, are pretty broad for vintage clothes and this dress *just* fits around them, and since the fabric doesn’t stretch, I have to be very careful when moving a lot (including sitting down) in it. This dress has one of those ridiculously tiny neck openings that seem to be common for the period, and my head barely fits through it. Same with the wrists on this dress–wtf?? I still totally love it though, and am proud to have it in my closet. 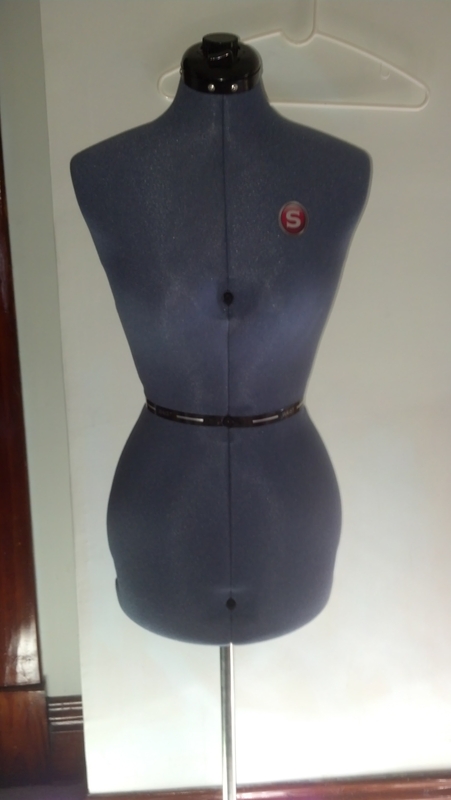 In “now” news, I got the bias binding pinned to the neckline of the Butterick 7131 dress. I didn’t have enough scrap fabric to be able to cut a long enough piece on the bias, so there will be two seams in the tape instead of one. Not ideal, but I’m making it work! I’ll probably sew that this week if I can get a free moment. Maybe I’ll finish it by the end of August, huh? Front view; please forgive the gross Keds! Going to have to take about 4 inches off the hem on this one! 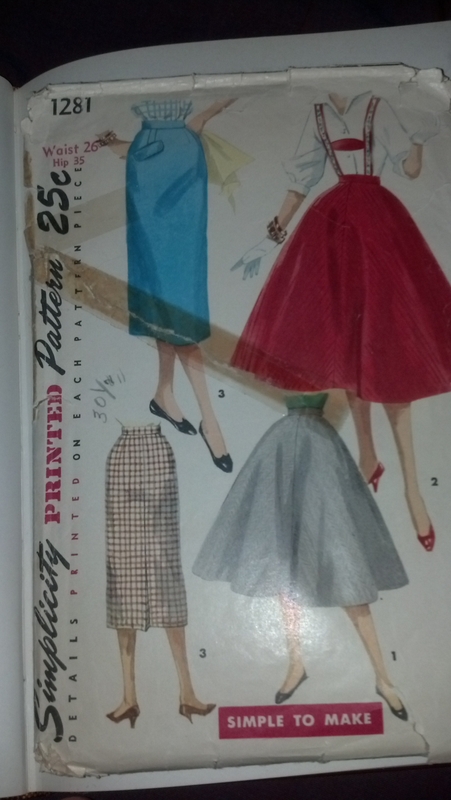 The pattern is a vintage Butterick–7131, to be exact. 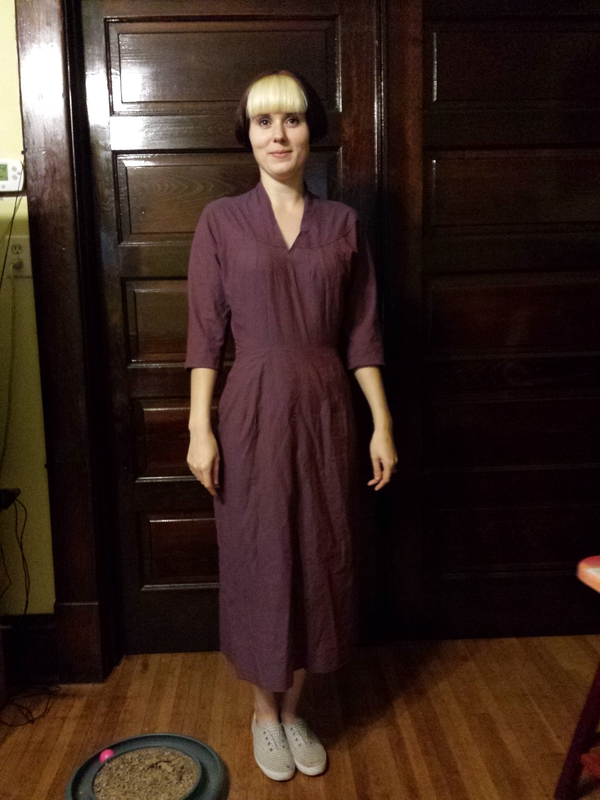 This was my first attempt at anything other than hemming a RTW dress, and it has a lot of beginner mistakes. First, and most importantly, I absolutely did not select a good fabric for the dress. It’s the exact same stuff that I used for my Hawthorn but in a different color; it’s an amazing fabric but is too light for this pattern. (If you’re so inclined, you can check out the fabric here. It comes in damn near every color, and it’s a dream to work with! I’ve got three more colors of it in my stash–2 future blouses and 1 future dress!) Second, I was too excited or stupid (or both) to be careful when pinning and sewing, and some of the darts are sewn down in the wrong direction. One of the side seams is slightly off from the waist to the skirt, the zipper could have been picked closer to the teeth, and so on and so on. The neckline is also a little uneven, and I did not do the facings at all because I couldn’t figure them out to save my life. So the entire neckline has been an exercise in improvisation. Using the experience gained from my Sorbetto adventure, I’ll be doing an exposed bias facing to finish it off. Hopefully I can even it up a bit as I go. I attempted to put this dress on Alice yesterday, only to have the top of the side seam pop a little bit. I don’t struggle to get the dress over my own head, so I’m not sure what’s wrong. Alice may not survive her probationary period if this keeps up! I’ve got a great bottom-weight cotton twill from Gorgeous Fabrics for this project, and can’t wait to start it. 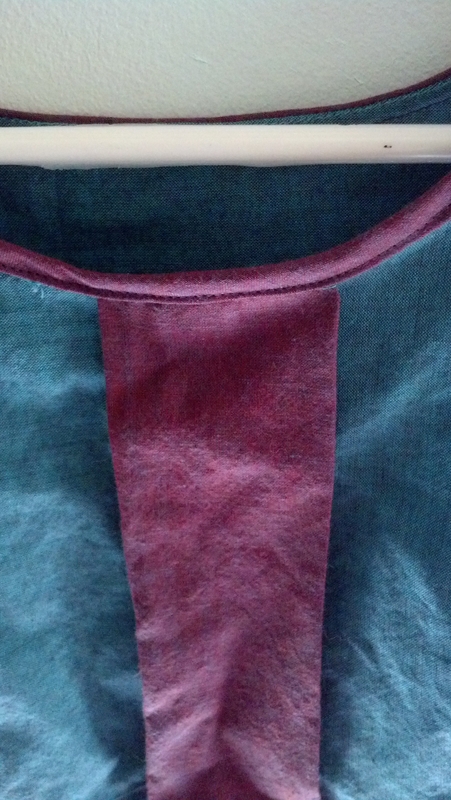 I’ll have to see how I do with letting the hem hang overnight–another first! What are you all working on at the moment? Clearing out your summer queue for Fall sewing, perhaps? I know that my head is positively swimming with ideas, but I seem to have no time to make anything! My immediate goal is to get the bias binding pinned around the wrong side of the neckline on the Butterick dress. Baby steps, right? It’s been handy having her around already: she wears my Hawthorne for me so that I don’t have to keep it in the closet! On Wednesday, I stumbled across the Sorbetto pattern from Colette. (Again, I have no idea how or where, but thank goodness for other sewists!) I downloaded and printed it and decided that I would make it out of some Hawthorn scraps so that I could wear it for an out-of-town thing we had this weekend. I cut everything out on Wednesday night and did all my sewing on Thursday. Unfortunately, I hit many a snag during the course of this project. 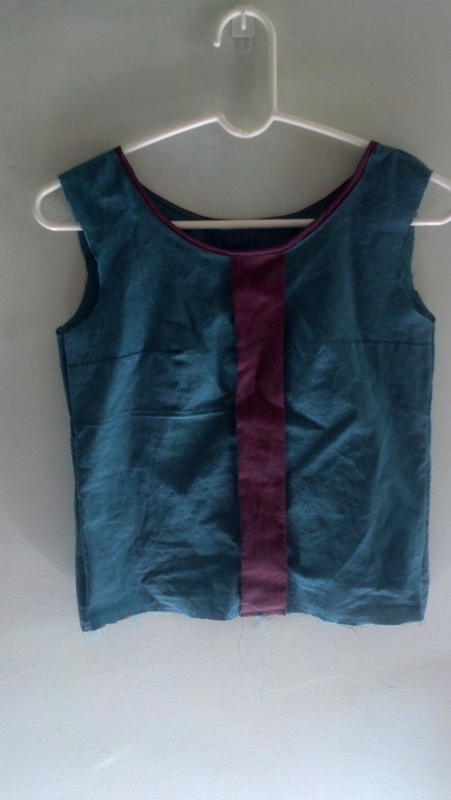 First, my scraps were not nearly plentiful enough to make this entire tank top–I cut the back on a fold, but couldn’t do the same for the front. I gonzo’d my way out of that by squeezing the front pattern piece onto the fabric twice and letting the pleat section overhang the edge. Since I had some other scraps (thank goodness I didn’t throw them out!) from another dress I’m working on, I substituted a strip of that for the pleat section. I measured it and cut the appropriate width, and sewed it to the front pieces just inside the pleat area; the idea was that I could then sew the pleat on the original pleat line without having bulky stitches. It worked! I gamely proceeded forth, getting so far as to attach the neck binding (in the contrasting color again) before trying the top on. BIG mistake. It’s super tight across my chest and barely goes on over my head! 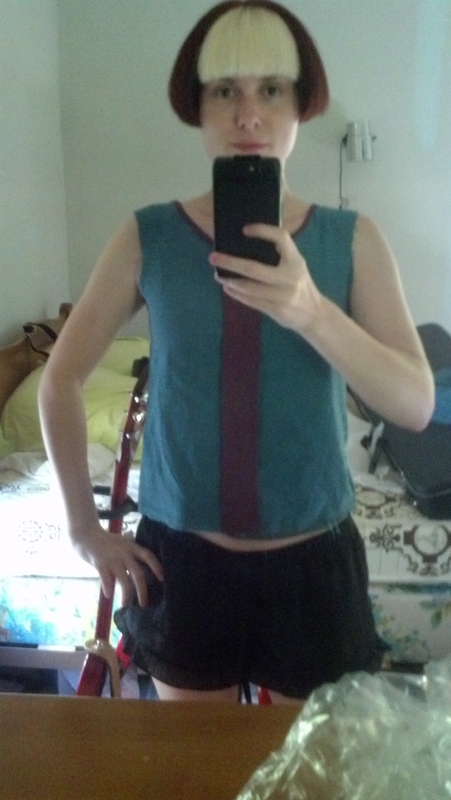 I cut the size 0 because that’s the size I wore in the Hawthorn; I assumed (dumb of me, I know) that the 0 in a 60’s-style swing top would also fit me. Nooooooooope. 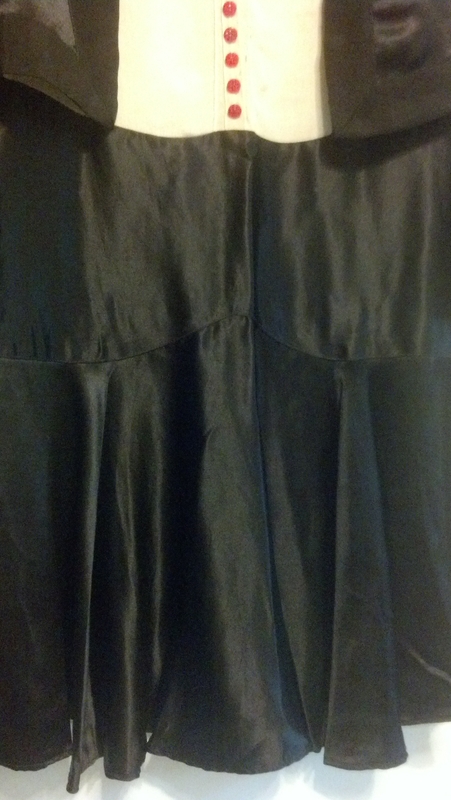 Not only that, but when I ironed the pleat and basted it, I apparently did it off-center. Since the color is contrasting, it’s pretty obvious. Lesson learned: don’t “eyeball” stuff, even on a quick project! At least my binding looks kind of okay! It may not look like it, but it’s super snug. In a bad way. After trying it on, I stopped working on the project. The armholes aren’t bound yet, and the hem isn’t done. 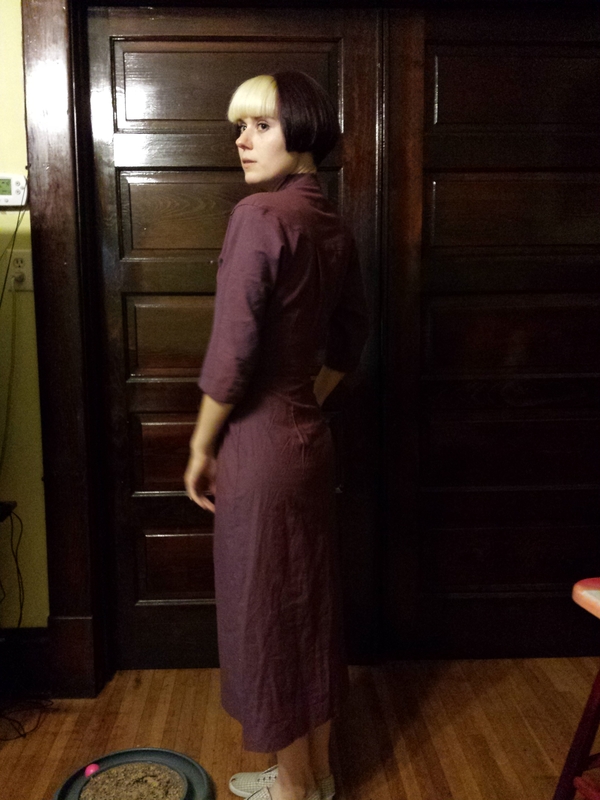 (Speaking of which, it’s already too short without being hemmed. I can’t win!) I did French seams again, and I’m thinking I will need to let them out and use a very small seam allowance instead to ease the pressure around my bust. I haven’t even tried this on with my bras, and it barely fits; adding the bra would probably pop the seams! I’ll also need to realign the center pleat, which means unpicking the very center of the neck binding. Needless to say, I headed out on our road trip wearing one of my RTW tank tops and a scowl! I’m trying to make myself feel better by finishing my other project and planning the next one. They are both from vintage patterns, and I’ll post more about them another night. Since we were so busy and sleep-deprived this weekend, it’s past this blogger’s bedtime!